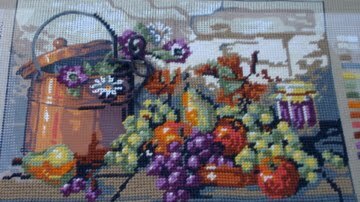 An on-occasion posting of the goings and doings of Nease's Needlework, formerly a retail shop, now an on-line business whose owner (that's me) is really getting into sharing with others in the blogging community. So very happy you came to visit. Now, pull up a chair, pour a glass of your favorite beverage, and read on about adventures in needlework. Let me first apologize for the lengthy time in between posts. Obviously my life has been in a bit of upheaval primarily with the whole job-search thing and interviews and let-downs and several-day-at-a-time postings. Which have been great for the adventurer in my blood but the non-standard work schedule has played havoc with my discipline to sit down and blog on weekends. Or during the week; seems that I prefer on my off days to upload merchandise to my website from my storage unit. Which is looking fabulous, by the way! I finally finished adding all of the Kreinik threads (quite simple once I created a "system" to count these sparkly threads in all of their Blending Filament or Braid manifestations) and most of the Mill Hill beads in house. Which meant unpacking a great big huge box that contained the Mill Hill bead hangers with all of their beads mostly still hanging, freeing up an incredible amount of room in my little storage unit. Just to be clear, this is not a post about needlework. I like to intersperse my entries on needlework and geeking out on stitching with things that are more about, well, my views on life in general. And I can already hear a couple of folks out there chuckling: "Fairness? Life isn't about fairness!" To which I reply: "You're right. Freddie Mercury is dead and Mick Jagger is still alive. Who had the better voice, I ask you? And who looked better in dancer's tights??" No, this post is about sports. Yes, sports. 2012 has been an interesting year in sports, hasn't it? Especially since September. The referees in the NFL went on strike and stupid things started happening. I remember the year when the umpires for MLB went on strike, or almost; seems that the closer the calendar got to Opening Day, the more willing the MLB umps were to negotiate their hitherto unfair contract. Not so the NFL's referees. Nope, not them. If the NFL was going to start its season, well then, by golly, these professionals would still hold out for a better deal. Let the calls fall where they may. And they did. I won't remind all of you of the bad calls, probably because NFL fans will know them better than I will. There was this attitude of "It's not fair to us, the refs, what our contract says, and we don't care enough about the game we're supposed to be officiating cuz, well, our terms aren't good enough." But then came this call on September 24, and more than the fans were outraged: the sportscasters, the players, the owners, the managers, the viewers at home . . . you get the picture. And I'm sure you remember the picture: the bright green Packers uniformed player holding a ball, a Seahawks player grabbing at the ball, one replacement ref throwing up his hands for a touchdown, and the other waving his hands in an "interference" call. Rule 8, Section 1, Article 3, Item 5 of the NFL rulebook discusses a simultaneous catch. "If a pass is caught simultaneously by two eligible opponents, and both retain it, the ball belongs to the passers. It is not a simultaneous catch if a player gains control first and an opponent subsequently gains joint control," the rule states. The rulebook also states when a simultaneous catch is ruled, you can't review who made the catch. You can only review if it was complete or incomplete. Jennings gained control first. That should have ended the game. So here was a perfect example of a rule that SHOULD have been followed but was not. It turns out that the bungled call replacement ref had not even been certified/approved/promoted to Division 1 calling (meaning NFL play calling). But because some official somewhere decided to keep the bungled call on the books, the call stood and the rule as outlined in the NFL playbook was ignored. Fairness? Definitely not. A good example of following the rules when they are in dispute? Nope. Personally, I groaned with the others watching this ridiculous excuse for a call and then chuckled as negotiations happened almost overnight between the NFL and its refs. Maybe now fairness can mesh a little better with the rules? Maybe now trained refs can call to mind the playbook and follow the rules as they are outlined? Let's hope so. Then a little less than 2 weeks later something happened between rules and fairness that sent me on a curveball spin at 102 MPH. If you know baseball, and have followed the Braves at all this season, you'll know that this was Chipper Jones' final season. Ever. He was a great slugger and contributed a lot to the Braves organization, and stayed with the Braves even when he could have negotiated his contract to sign with another team. He showed loyalty to the team and, most especially, to the fans. Something Smoltz and Glavine and Maddux did for most of their careers. But this is about Chipper and rules. And misapplied rules and fairness. You see, baseball has a long history and a lot of rules. There are some that are applied often (like, you can't strike out after strike 2 on a series of foul balls, no matter how many foul balls you hit while you're at bat, unless one of the opposing players catches one). It seems like an unfair rule, unless you're the team whose hitter keeps hitting foul balls and then lands himself on base, finally. The Braves did a lot of these hits in the early 90's. Lots. No, the rule in question was the oft-neglected, seldom-used infield fly rule. And its use in the Wild Card game on October 5 was incredibly controversial. It is explained well in this article written the morning after the night before. Webmaster Bill and I had gone down to a local pub to watch the game, and we were psyched. It was the Cardinals, granted, and our Braves were down, but we were the "Come from Behind Braves" since way back, and it was the game that was going to determine who was going to advance to post-game play: the Braves or the Cardinals. And it was Chipper Jones' possible last game. At home. "An infield fly is a fair fly ball [not including a line drive nor an attempted bunt] which can be caught by an infielder with ordinary effort, when first and second, or first, second and third bases are occupied, before two are out," says Rule 2.00 in the definition of terms. "The pitcher, catcher and any outfielder who stations himself in the infield on the play shall be considered infielders for the purpose of this rule." Really? Really?? Did anyone see how fast and how far into the outfield the shortstop (an infielder) ran? Was that an ordinary "stationing himself" kind of run? Really? It was the reverse of the NFL bungled call: an obscure rule, not an ordinary rule, was applied at a critical and inappropriate time of the game. And what would have been gracious fairness, letting the ball drop where it was and charging an error on, say, the left fielder who was calling the shortstop off it, was ignored. Which made this crucial game Chipper Jones' last. Which was so dreadfully unfair to the game of baseball that the head spins. It was the equivalent of David Justice's run towards home during the playoffs in 1991 when he rounded 3rd base and (maybe) touched the bag, but the shortstop (!) saw him stumble at 3rd, so his arrival at home plate did not count as a run. The replays showed a puff of dust coming off the bag from his foot hitting it. Or the botched Perfect Game call against the Detroit Tigers pitcher Galaragga in 2010 (which is why I'm rooting for the Tigers in this year's World Series, although Sandoval's 3 Home Runs in the 1st game puts him in a very small group with Babe Ruth, Reggie Jackson, and Andre Pujols which makes me a happy person), the game where the umpire called the runner at 1st base safe and when he realized his error, he called up and with tears in his voice asked that the call be changed to runner out at 1st to give that pitcher a Perfect Game. But no. No, because some official somewhere needs to officiate something and show his authority by ruling in an unpopular fashion, neither the Tigers' Perfect Game (the 3rd Perfect Game that season and the 21st in all of baseball) nor the random and inappropriate infield fly rule stayed. For no good reason. And Chipper's last game and 19-year career ended with disgrace and infamy. And controversy. And no umpire had the least regard for the game or for the fans or for a single player, only for his own perfection in calls. Except there was no perfection in this call. Or in the NFL ref's call. Only an error in judgement and a refusal to admit when you're wrong. That is neither the rules nor fairness. It's bad sportsmanship, and all responsible for holding these wrongs where they are should be shamed for the rest of their professional careers. It's the least the Universe can do to restore some fairness in the world. It's desperately needed. Oh, The Weather Outside is Frightful so I'll stay in and Drink this Beer!